Featherweight prospect Christopher “Pitufo” Diaz of Puerto Rico improved his record to 18 – 0 (11KO) winning a unanimous decision over Raul Hirales (22-6-11, 11KO) of Mexico in the main event of the Top Rank Boxing sponsored “Solo Boxeo” at the Osceola Heritage Park Exhibition Hall in Kissimmee, Florida on Friday night. Diaz, promoted by Top Rank and a stable mate of WBO Latin American Lightweight Champion, Felix Verdejo, was headlining his first card and did not disappoint the predominantly, Puerto Rican crowd. Diaz landed sharp, clean body shots and combinations throughout the fight and was never in trouble against Hirales, one of the toughest opponents he has faced to date. As the fight progressed Hirales was able to land some clean shots to the head of Diaz, but each time he did, Diaz countered effectively with crisper, harder combinations that stifled any momentum Hirales hoped to build. Diaz worked harder and more effectively each round, never leaving the outcome of the fight in doubt. Both fighters came out slugging in the eighth and final round with Diaz finishing strong to seal the victory. Earlier in the night, in a stunning upset, previously undefeated, Top Rank featherweight, Toka Kahn Clary (19-1-1, 13 KO), was knocked out in the first round by Jhon “The Disaster” Gemino (15-7-1, 7KO). Clary, the more aggressive fighter from the start, showed glimpses of his speed as he flicked his jab at the shorter Gemino. But Gemino was a quick study and midway through the opening round countered one of Clary’s jab with a perfectly timed, overhand right that cracked Clary across the chin and dropped him to the canvas. Clary was unable to get off the mat and was still clearly dazed long after the referee counted him out. Gemino leapt for joy in his corner as he was declared the winner at 1:30 into the first round. A huge underdog coming into the fight, this was by far Gemino’s biggest victory as a professional. 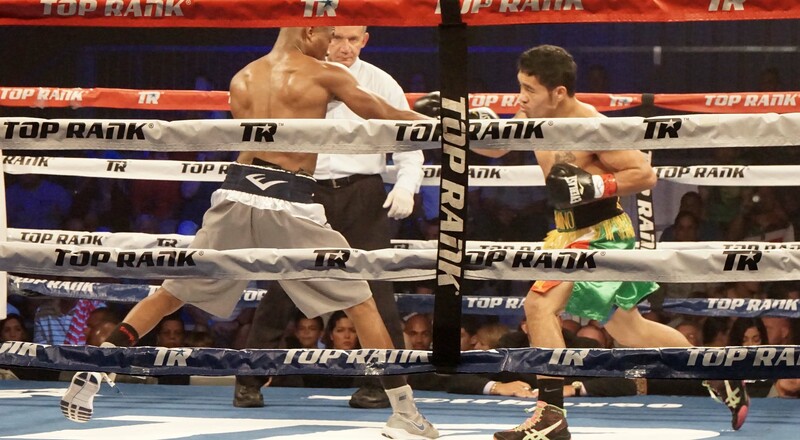 In the most entertaining fight of the night, Super Lightweight, Julian “Hammer Hands” Rodriguez (14 – 0, 10KO) outslugged Brazilian Claudionei Lacerda (17-16-1, 12 KO) in an eight-round thriller, eventually winning by unanimous decision. Rodriquez, also a Top Rank fighter, almost suffered the same fate as Clary as Lacerda came out swinging and dropped Rodriguez to a knee with a crunching left to the body early in the opening round. Fully intending to end the fight, Lacerda followed up after the mandatory eight with a wild flurry that Rodriguez was able to fend off with good defense. 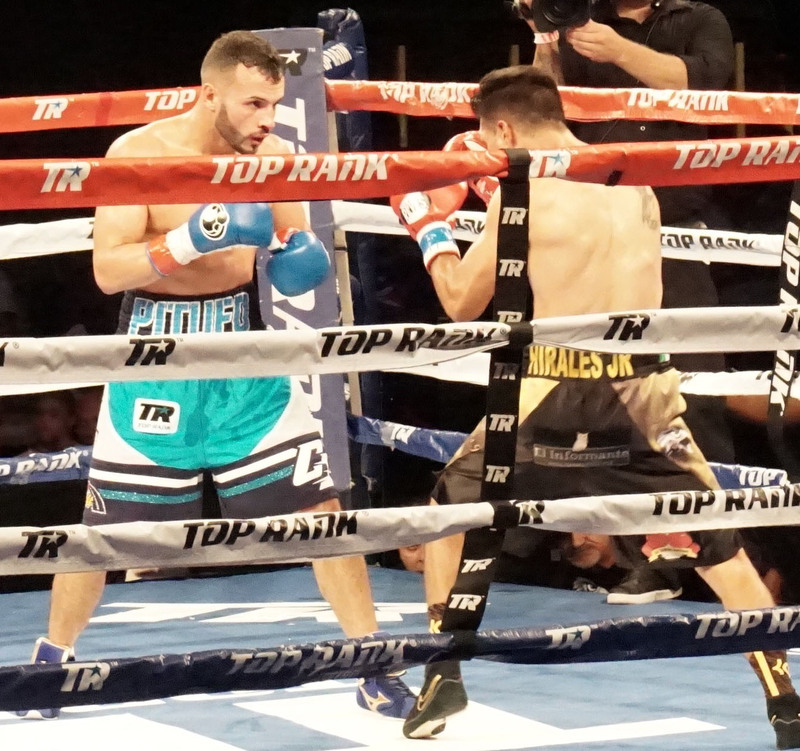 As Lacerda slowed his attack, Rodriguez, a former Golden Gloves Champion (141 lbs) from New Jersey, was able to climb back into the fight with several hard lefts that rocked Lacerda. The action went back and forth for the remainder of the round and set the tone for the rest of the fight. Fully recovered from the knockdown, Rodriguez came on strong and clearly won the second and third rounds by connecting with several, hard combinations that hurt Lacerda. Though outmatched, Lacerda showed great heart and stayed in the fight with his aggressive counterpunching in the fourth. In the fifth round, Rodriguez stunned Lacerda with a hard right to the head, but Lacerda still would not quit, coming back and having perhaps his best round in the sixth. In the seventh, Lacerdo hit Rodriguez with a clean, uppercut that shook Rodriguez, but only momentarily. “Hammer Hands” then turned it on to finish the round strong, punishing Lacerda with a series of strong lefts to the body and head. The eighth and final round was more of the same as Rodriguez and Lacerda gamely mixed it up. Rodriguez landed a hard, right to Lacerda’s chin midway through the final round that hurt Lacerda and excited the crowd, but he was unable to finish the tough Brazilian and the outcome was left to the judges. A physical fight with lots of clinching between exchanges, both fighter’s faces were red and swollen at the end of the bout. The final scores were 77-73, 78-72, 78-72 all in favor of Rodriguez. The final Top Rank fighter on the card, Jean Carlos “Chapito” Rivera (8 – 0, 5 KO), was dominant in his victory over Raul Chirino (7 – 3, 3 KO) of Miami. In his one round of action, local, Orlando boxer and fan-favorite, Rivera beat Chirino high and low, bloodying Chirino’s nose and pounding his ribs. A crisp uppercut after a body shot midway through the round forced Chirino to take a knee for a mandatory eight count. More punishing body blows by Rivera, one of Top Rank’s most highly regarded prospects, and Chirino had the fight taken out of him. He barely survived to the bell ending the first round and was unable to answer the bell for the second. The win kept Rivera’s professional record a perfect eight wins against no losses. 2014 Golden Glove (152 lbs) winner Sammy Valentin (8 – 0, 6 KO) of Tampa, FL defeated Gledwin Ortiz (4 – 2, 3 KO) of the Bronx, NY with a 3rd round knockout in a competitive, back and forth fight. Valentin caught Ortiz with a hard right on top of the head that dazed Ortiz midway through the third, then followed with a flurry of lefts and rights, culminating with an upper cut that dropped Ortiz to the mat. Ortiz beat the count, but was still wobbly, forcing referee Frank Santore to call off the fight. Jonathan Irizarry (2 – 0, 2 KO) of San Juan, Puerto Rico overwhelmed Nolasco Tomas (0 – 2, 0 KO) scoring a knockout 1:32 into the first round to score his second consecutive knockout victory to begin his professional career.